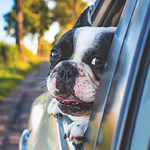 If you love your dog but also love your vehicle, you might want to pay special attention to a couple of key features. Having your pet with you on a car ride can be great, but it can also lead to car damage if you're not careful. With a couple of extra features, you can keep your vehicle cleaner and your dog safer. One of the least expensive features to invest in if you have a dog is a set of rubber floor mats. Dogs can track mud into the vehicle on their paws, and rubber floor mats can be cleaned just by spraying them off. Investing in this feature will also protect the floor of your vehicle from the occasional times that your dog gets sick. You can also invest in a gated carrier in the cargo area. Some vehicles come with them already installed, and they'll keep your dog safe in the event of an accident.